Macassar ebony’s density produces strong, clear highs and lows, while a cedar top adds sparkling midrange tones. 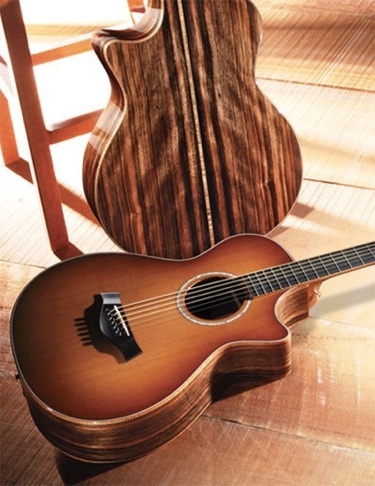 Make it a 12-Fret and you’ve got yourself a guitar with remarkable character. The lower bridge location of the 12-fret neck, together with the cedar top, yields extra warmth and woodiness. Responsive to a light touch, these beauties are ideal for a serious fingerstyle player looking for a darker, richer tone. Strummers will be inspired by the depth and sustain. And they’re no less visually inspiring, with Macassar’s beautiful variegation, koa binding, a slotted headstock, and an edge burst top. This guitar is no longer available. The page has been left for comparative purposes. To be notified of our Limited Editions BEFORE the general public, contact me at diego@deoromusic.com to be added to our mailing list.